Hello. Has anyone ever heard of Roku and wonder whats its about or if they are any good? Well here are somethings you might like to know. 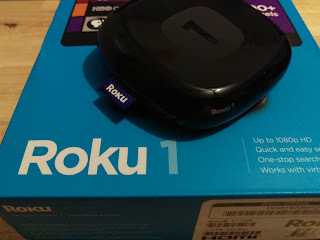 I recently got my hands on two of the four Roku devices. I have had them for a couple months now and that has given me some time to come up with my thoughts on them. My wife and I have been wanting to get SlingTV for awhile now but we didn't have a device that connects to our TV that has SlingTV. So I decided to buy a Roku. I bought a Roku 1. Why? It is the slowest one after all. Well I got it because we still have an old standard def TV in a room where I want to uses the Roku. Weird right? Well the Roku 1 does standard def TVs and HD TVs. So when I finally do replace the TV the Roku will still work and I won't have to purchase another one. So what does the Roku has a far as physical aspects. The Roku 1 does come with its own remote. It uses a standard infrared remote so you have to point it at the Roku. The Roku 1 itself is fairly small. Only slight larger then most smartphones. It connects via Wi-Fi so make sure you have a strong signal for it. It is powered with its own power adapter. One thing I noticed that is weird about the Roku is that it never turns off. It just goes into a sleep mode to conserve power. Turn on your TV and press a button on the remote, the Roku comes back to where you left it. Its build construction is solid and feels sturdy. It shouldn't be moving around much though anyway so this shouldn't be much of a concern. Now how about software? The Roku software is simple and easy to navigate. Setup is nice and the Roku brings you through it. Then you add the channels (thats what Roku calls its apps) that you want. Log into those channels, such as Netflix, Hulu, and Amazon Prime, with your accounts and start watching. Each channel works a little differently. Such as how to turn on subtitles for example. Other then that you are just watching TV like you would on any other device with those apps. Now when we got SlingTV they had a promotional going on. By three months up front and get a free Roku Streaming Stick. Of coarse I jumped at this since we were going to have Sling for at least 3 months. Now the Roku Streaming Stick is a little more advanced then the Roku 1. It plugs directly into a HDMI port on your TV. You need to plug the adapter it comes with in to the Streaming Stick for power. 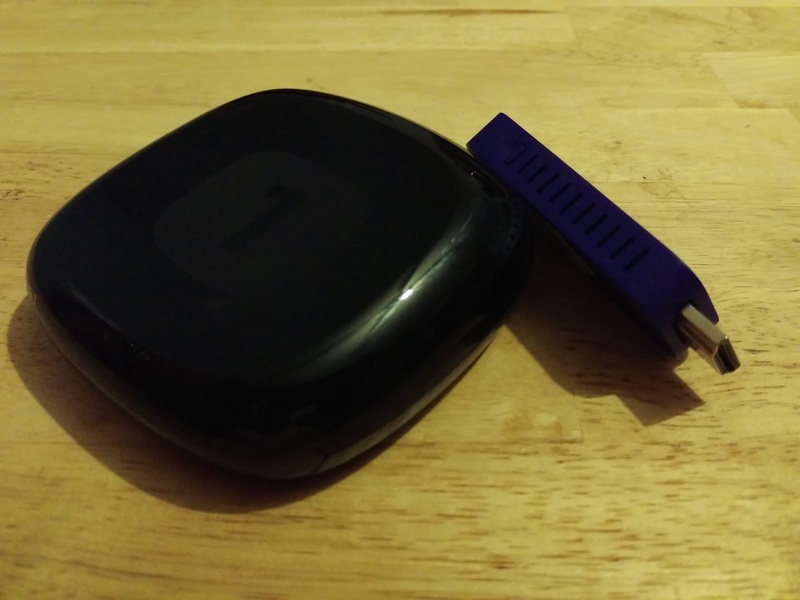 It uses a adapter with a USB cable similar to the one your smartphone uses to charge. Its remote is a little more advanced then the Roku 1's too. It uses a wireless signal to talk with the stick rather then infrared. Software on this one is simple. Its the same as the Roku 1's. Not a thing different. A nice bonus with the Rokus is the free app you can get for your smartphone. Its lets you use your phone as a remote and has a extra bonus feature. If you want to watch a show but don't know what service it is on you can search for it on the app. After the search it will tell you what services your show or movie is available on. The app finds your Rokus by seeing what Rokus it can find on your local Wi-Fi network. It also send commands this way. Which is nice because if I had one negative to say about the Roku's is that the infrared remote is inconsistent sometimes. We have gotten used to it so we don't have problems any more but there is a learning curve. Both the Roku 1 and Roku Streaming Stick are $50 at roku.com. So unless you have a standard def TV then I suggest the Streaming Stick. All in all I am happy with the Roku's and defiantly recommend it. It meets all my streaming needs with very little power usage and consistent performance. Exactly what I was hoping for. If you have any other questions about it please put it in the comments and I would be happy to answer them the best I can based on my experience. So. 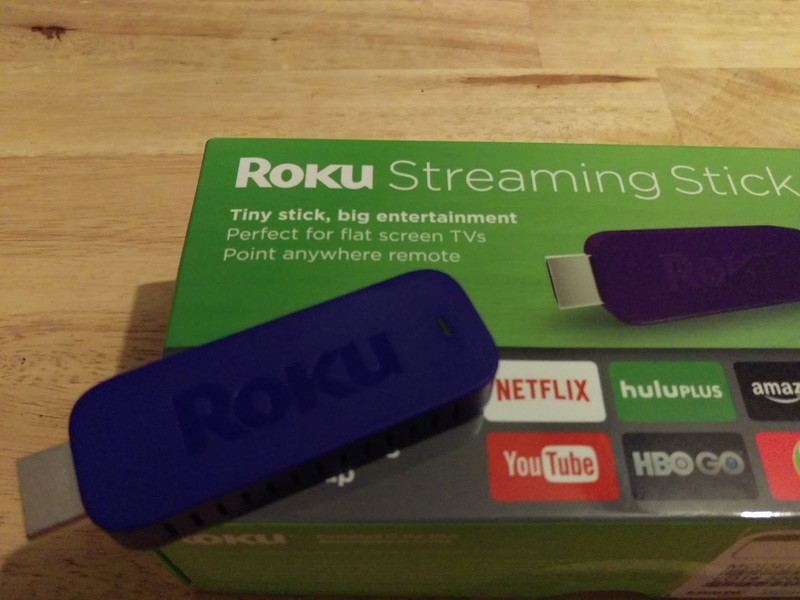 Are you ready to become a cord cutter and get a Roku?